Bones and tough chews can be harmful to your dog’s teeth, but soft toys may be too soft. That’s why rope toys can be a great middle ground for your dog. It lets them exercise their will to pull at and chew stuff, without risk of damage to their teeth and gums. Swallowing threads from a rope toy can be more hazardous than pieces of a harder material as the dog is more likely to try and digest them. If your dog is chewing on the toy (rather than pulling it with you), keep an eye on them. They’ll generally focus on the toy itself, but every dog is different and some may try to eat the threads that come away. Dogs love to play with humans and rope toys give them a great way to use their strength and playfulness. This helps build their relationship with you and is a lot of fun for both of you. But, try and let them win from time to time. I’m looking at you Dad. A good quality rope toy should be robust enough to withstand a lot of chewing from small, sharp puppy teeth and it’s a much softer experience for the puppy than a solid toy. But, as with any dog, keep an eye on them to make sure they don’t try to eat the strands. That said, most dogs will claim victory over the strands that come off and ignore them to finish the battle with the remaining toy! 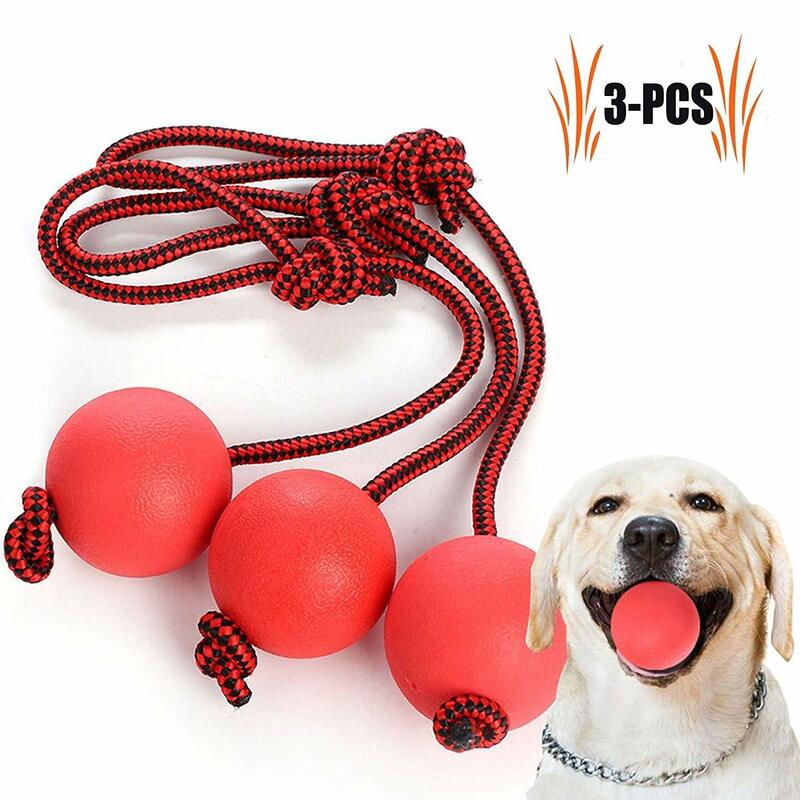 This 3 pack of rubber balls on ropes are a fantastic, high quality and durable purchase for dog owners. The rubber is made of a hard material that does not break easily. It lasts longer than all other toys made for dogs. These balls are made of a material that is not harmful to the environment. Toys that are red in color attract your dog’s attention more than any other color. The size of the ball is approximately seven centimeters and the length of the rope is almost twenty-two centimeters which are the ideal size of toy for medium and large sized dogs. This toy has an amazing design with a rope that is safe and durable enough for dogs to play with. In the case of digestion, the material is not in the least bit toxic to dogs. You can use this toy in order to train your dog to fetch things when you throw them. It keeps your dog active, happy and energetic. This toy increases your interaction and bonding with your dog. This toy is used by the dog to chew on and play with and can also be used to train a dog. It gives the dog something else to chew on and destroy rather than your furniture and other household items that are not meant to be destroyed. This toy keeps your dog mentally alert and curious as well as serving as a source of entertainment. The balls and rope really are durable, even for the largest, most aggressive of dogs such as a Rottweiler, Doberman, German shepherd, and Dalmatian. They are also attractive, entertaining and of a high quality which means they are not prone to be destroyed or damaged easily because of chewing or playing by the dogs. These were the topmost ball toys for dogs by customers who had tried other toy ball toys for dogs. These balls are definitely the kind of toys your dog craves and do not need to be replaced frequently because they are long-lasting, durable and strong, and not prone to destruction by dogs of all kinds, whether they are large, small, or medium size. It can boost the activity of even the laziest and unenergetic of dogs, they can use to make the dog more animated, and give them the much-needed exercise in a fun, entertaining way for the dogs. Dogs love to chase, retrieve, shake and chew things. Therefore, it is very important to have productive toys around them, so they do not ruin or play with the things they are not supposed to. The Kerbl Cotton Bone is such a toy and is a must have for all dog owners. The Kerbl Cotton Bone is an interactive toy made out of cotton and jute which will last long even when your dog tries to rip it apart. So quality is not a matter of concern because it is made with the highest quality materials so that your dog doesn’t pull his or her new gift apart. The Kerbl Cotton Bone is known to last longer than all the other cotton toys and customers throughout the world have appreciated this. The ends may be chewed off due to rigorous pulling but your dog will not be able to unravel the Kerbl bone from the middle due to its sturdy make. The Kerbl Cotton Bone comes multicolored in order to grab your dog’s attention the minute he spots it. This toy contains natural fibers which play a significant part in cleaning your dog’s teeth. Throughout the day your dog is likely to bite and chew the toy which has many benefits. The Kerbl Cotton Bone is an excellent toy for retrieving purpose, and your dog will be busy throughout the day with this multicolored and multi-textured rope. It is a perfect fit for teething purposes for younger dogs as well. Even after rigorous chewing the toy remains in good shape and will not tear apart. You can teach your dog many things with this toy such as the basics of obedience and also many games like fetching and speak on command. As a puppy grows, it requires a few things to strengthen its jaws which will lead to a powerful bite so it is very important to provide them with these toys. Another benefit is that buying such low priced toys will keep the dog’s teeth healthy and will save a lot of money as compared to dental chews. The Kerbl Cotton Bone is great value, coming in at less than £5. Over time your dog will chew through it, but you’ll both get good value for money! The Focuspet braided rope toys offer more than just playtime. Have you ever thought of a toy to be more than just a symbol of joy and pleasure for your loved pet? As children playing with interactive toys will enhance their abilities to communicate, understand situations and also increase thinking capabilities, the same applies to our pets. The Focuspet braided rope is made out of pure cotton; it is safe and nontoxic which also makes it clean and edible for your dog to chew it without any damage. This toy is distinctively modeled for highest quality which will not harm our dog even if the little puppy eats some of it out of joy. 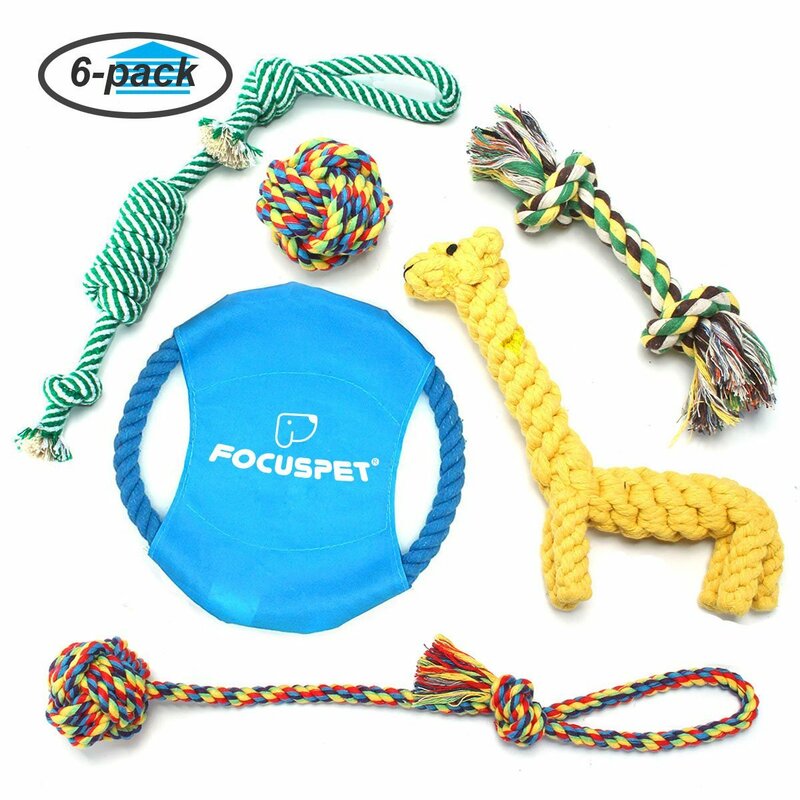 The package includes 6 types of pet bite toys, and all 6 are in different color and different shape which include; a long lob, rope ball, giraffe, frisbee, rope knot and candy rope knot. Therefore, with this one packet, your dog has a wide variety of toys to play with and is never going to get bored when you are not around. It is suitable for indoor and outdoor play. The most exciting feature of the Focuspet set of toys is that it is extremely beneficial for the dog’s teeth. This rope chew toy features solid knots that help clean your dog’s teeth and also improves dental health. Chewing on these safe cotton ropes will keep your dog’s teeth and gums healthy and will also strengthen its jaw. This is extremely vital for puppies because they need to nourish their jaws and need great amount of exercise to improve their bite and keep their teeth clean. As well as offering much joy, this collection provides a combination for grinding teeth which can reduce the rate of having calculus and also sustains the freshness of oral cavity. It is also very important to play with dogs and puppies as it keeps them mentally and physically smart. Also, with such an interactive play time your dog will enjoy every moment spent with you and, thus, it will create the strong bond, your self-esteem and you will find your dog much more obedient towards you. Many toys exist in the market, but Focuspet toy set allows a multifunctional play which keeps the dog lively, clever and active. Young puppies need to have their judging abilities enhanced, and that can only be achieved by smart play. Chewing on these braided ropes will release the frustration and energy inside the dogs, and it will also keep your furniture safe. This is a perfect choice which offers joy as well as many other benefits. 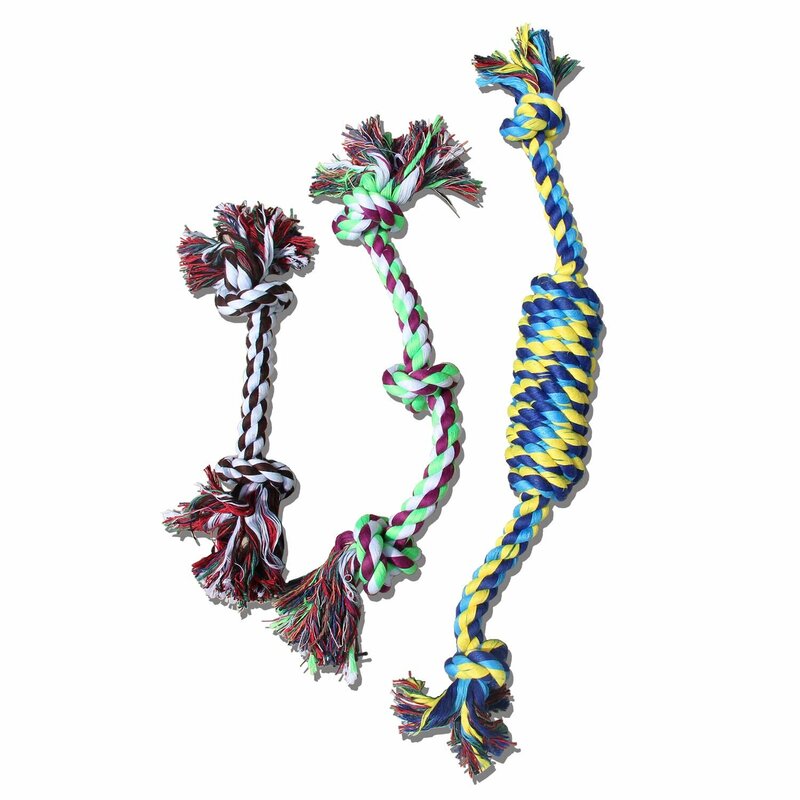 Tailmate Dog Rope Chew Toys are great because they offer much more than just playtime. It is t also a form of schooling which will enhance your pet’s abilities. These rope chew toys are the perfect gift for your dogs as they can exercise their jaws and strengthen their teeth while they play with you. Tailmate Dog Ropes are made out of heavy duty pure 100% cotton, and they are carefully crafted in bright and distinct colors. They’re great for dogs of all ages, but are particularly recommended for puppies as they are durable and can endure whatever your puppy throws at them for a good amount of time. Although some dogs with a stronger bite will wear the toy down, most should get a few months use out of them, which makes them great value for money. In fact, these rope toys last longer than most on the market just now. The package includes 3 toys, small, medium and large. Dogs love to chew. It helps strengthen their gums and teeth, and they get a lot of enjoyment from it. Rope toys are a perfect toy for dogs as they are sturdy and allow you to play with your dog (frankly, without getting out of your chair if you don’t want to! ), or it gives them something to chew on their own. Tailmate Dog Ropes are a great brand and popular with many dog owners, so you know you’ll always be getting a reputable product. 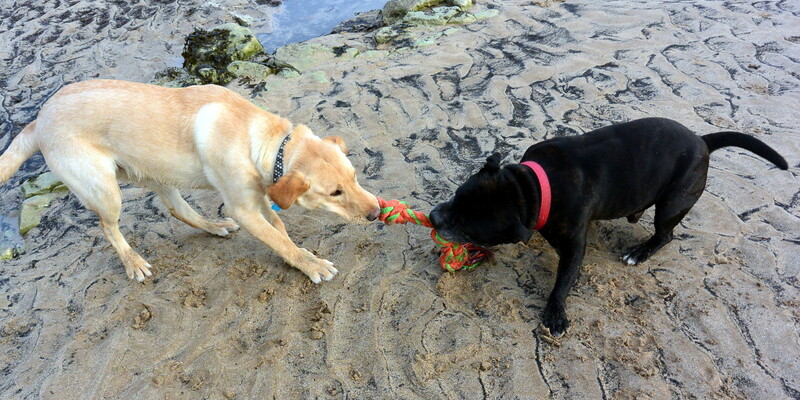 Given that you pick up a pack of 3 rope toys for under a tenner, makes them great value too. These toys are a great gift for your dogs and we’re sure you’ll get some enjoyment from them too! Do you have a question about dog rope toys? Oh my Labrador LOVES playing with his rope toy and despite the fact that he’s a prolific chewer, his rope toys (tailmate) are lasting really well. Highly recommend! The Tailmate rope set really is great value. I bought a pack months ago and they have lasted well and aren’t showing any sign of fraying.